HyperForm leverages years of Altair’s experience in manufacturing simulation , process design and combines several of Altair’s state-of-the-art technologies from Geometry manipulation to model setup; fast, reliable and scalable finite element solver; Optimization technology; powerful post-processing in an intuitive and natural workflow familiar to designers and engineers for efficient stamping product and process development. HyperForm is a comprehensive solution with specialized features to analyze and optimize each phase of the product development cycle. Also integrated to reap benefits of simultaneous engineering minimizing total cost. Product Design: Early manufacturing feasibility using fastest One-step solver. 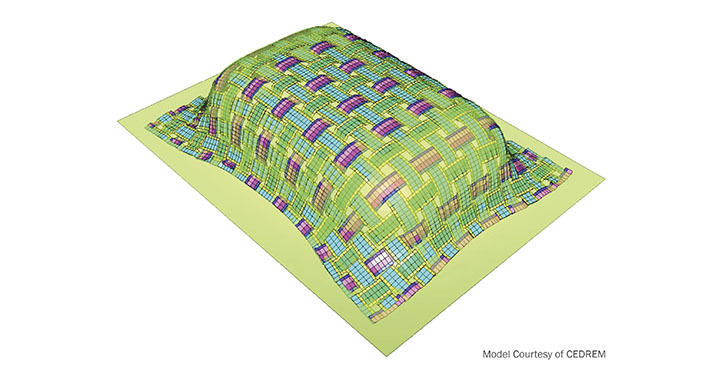 Die Engineering: Die surface development using Parametric and NURBS Surfaces, Validation using Fast, Accurate and Scalable Incremental analysis. Tryout and Production: DOE and Optimization enabled for robust product and manufacturing process. HyperForm provides best ROI in its class with functionality and affordability to meet demands of customers varying from individual analysts, tool shops, to large OEMS. HyperForm: Highly efficient comprehensive platform for the stamping product development cycle. 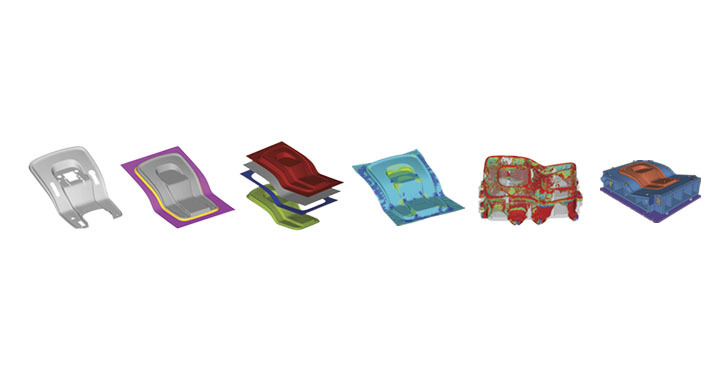 HyperForm Solista: Forming simulation essentials for product design and manufacturing in a Standalone Package. HyperBlank: Early manufacturing feasibility and material Costing for product design in a standalone package. Customers worldwide from individual tool shops to large OEM’s have benefited using HyperForm to a) improve the product design for easy manufacture at early concept stage, and b) develop reliable and robust tooling that minimize die tryouts and press down time resulting in quality parts conforming requirements. Thereby maximizing efficiency and significantly reducing cost and time for product development. HyperForm’s One-step®, HyperBlank® helps product designers to quickly and reliably check their design’s for manufacturing feasibility with minimal process inputs. The inverse solver, fastest and most accurate solver in the market place allows to validate several design alternatives, gauges, materials in seconds to finalize the design early in the product development cycle, minimizing downstream formability challenges and associated costs. 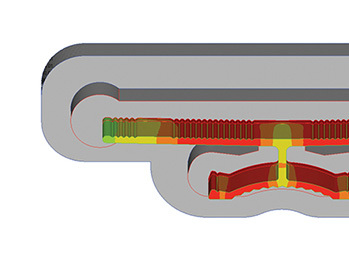 Product features can be optimized for ease of manufacturing and performance by coupling feasibility analysis with Optimization to quickly arrive at optimal design. 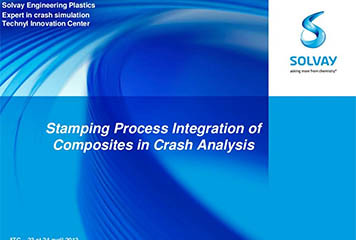 Product performance analysis (Structural, Thermal, NVH , Crash, Drop test, Fatigue) accuracy can be improved by mapping results from forming feasibility. HyperForm Nesting ®, HyperBlank ® allows design and costing engineers to quickly flatten the designed part and nest them for a progressive die, transfer die forming, for maximum material utilization within manufacturing constraints. Product designs can be further improved from nesting layouts for best material utilization, performance and minimal cost. HyperForm Die Module ® enables tool makers, engineers, designers to identify stamping features of the product, establish the manufacturing process and rapidly create and modify die face designs for each of the steps in manufacturing the part from flat sheet of metallic or composite material. The die faces are transformed to tools automatically in HyperForm Incremental ®or HyperForm Solsita® and entire manufacturing process is virtually simulated using accurate incremental solver RADIOSS® to check the designs for potential defects. Parametric and NURBS modelling of die surface allows to quickly modify the die surfaces and repeat this cycle to arrive at feasible design. 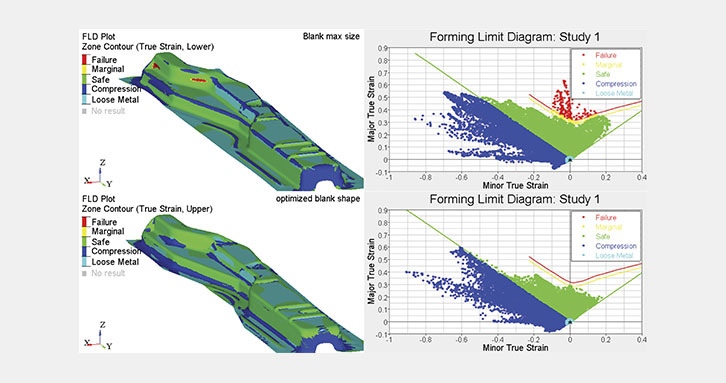 Using Altair’s HyperStudy®, optimization can be enabled with RADIOSS® to optimize the design that avoids defects, minimize die tryouts and press down time resulting in quality parts conforming requirements. 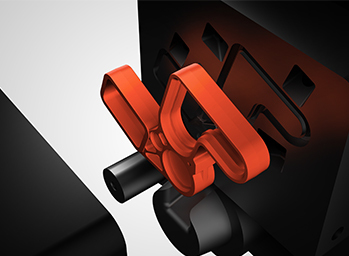 Hyperform® provides unique opportunity for tool makers to optimize the die structure using Altair’s Optistruct® for maximum tooling life with minimum material to save cost. 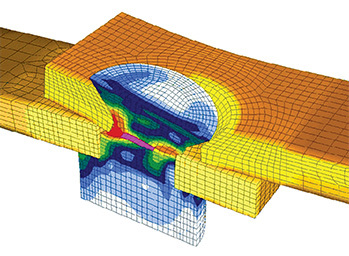 Altair’s stochastic analysis software HyperStudy® coupled with incremental simulation allows tool makers to perform what if studies, six sigma analysis, DOE analysis on the established design to identify its sensitivities to different process parameters. This is of immense help to die tryout engineers as the cause for the potential defects that could occur are known ahead and dies could be proven in tryouts for production. Production engineers can monitor and control the identified sensitive process parameters within acceptable limits to avoid any defects and down time in press lines resulting in big cost savings. Process information like process type, draw direction, blank holder, drawbeads can be added to the feasibility analysis to take it closer to the real stamping process. Fastest and most accurate solver in the market place with results in seconds. 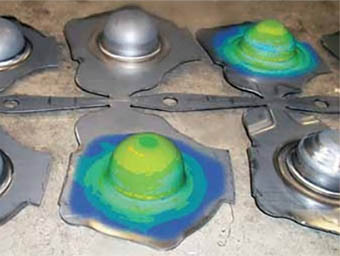 Quick and efficient tools to interpret the results for potential forming defects. Flatten product to flat blank or any preform shape of user’s choice. Optimal Nesting of blank shape in coil for progressive die and Transfer die forming with manufacturing constraints for maximum material utilization. Simplified interface to setup optimization of product features for forming feasibility using HyperStudy with One-step solver. Forming feasibility and nesting in batch mode with minimal user inputs for several parts on post-release BOM for quick overview of released designs. 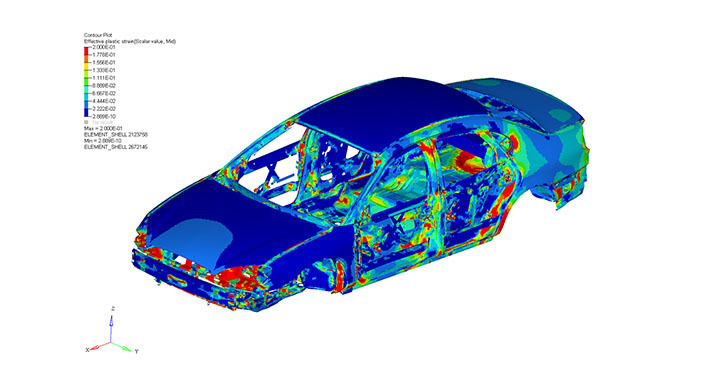 Forming results for mapping to product performance analysis (Crash, Structure, Thermal, NVH, and Durability) to improve its predictive accuracy. Intuitive work flow for designers to go from the product to complete die face design. Automatic and Manual binder surface generation from the part geometry with options to edit them to user needs. Powerful parametric and NURBS based addendum, drawbar, draw bead surface development to quickly create, modify multiple variants of die face designs. Automatic trim line development on the die face to account for any flanges and omitted part features. Quick check on trimming feasibility along the trim line. User friendly and intuitive interface for designers and engineers to setup models for all sheet forming process types including hot stamping with quenching. Single user interface to setup forming process for blanks of different types: sheet metal, plates, tubes and composite plies. Users can create their own custom process and store it as templates for quick reuse and share them to establish uniform modelling practices in a team. Transfer die or progressive die forming can be modeled using multistage manager that can stich several individual stages and manages movement of the blank from one stage to another as in reality. Fast, Robust, Accurate and Scalable Incremental solver RADIOSS provides quick and best-in-class forming and spring back results. Efficient result interpretation in HyperView ® with special tools for forming relevant post processing like FLD, Draw-in, springback displacement relevant to fixture points, springback compensation, Blank shape prediction, etc..
Simplified interface to setup optimization of process parameters, blank shape, tooling parameter in a stamping process for forming feasibility and springback using HyperStudy with RADIOSS. Trim line and Blank shape optimization to support net shape manufacturing. Die structure topology optimization using RADIOSS with Optistruct for maximum tool life and lightweight. Model setup and optimization of tube forming process: bending and hydroforming. Model setup for LSDYNA® as an alternate incremental solver also available.